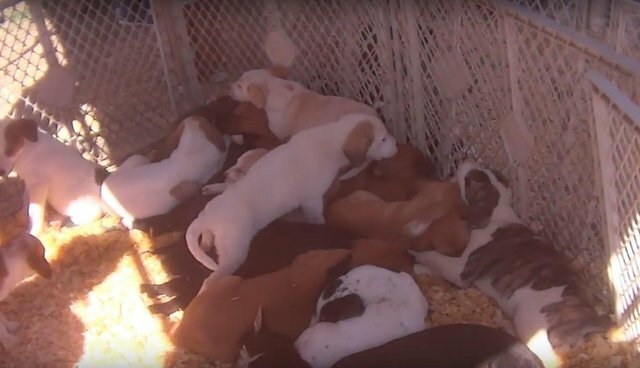 Dozens of dogs can be seen crammed in a pen, left in the hot sun without food or water, in a recent video taken at a Texas flea market. In other shots, puppies are packed into small wire crates. 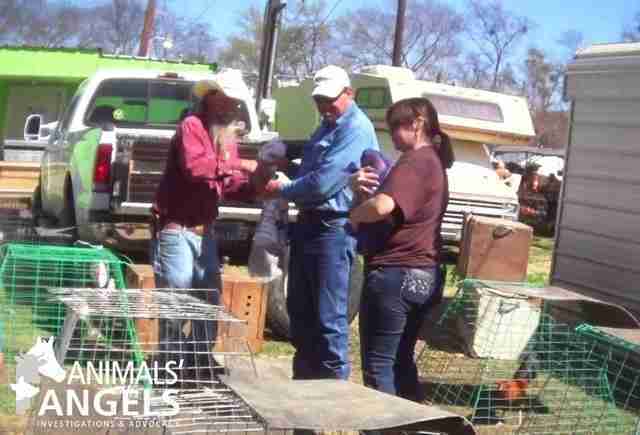 The footage was taken by Animals' Angels, a Maryland-based welfare group that conducted an investigation at the First Monday Trade Days in Canton, Texas, this spring after being contacted by several concerned locals. "They said that they'd seen a lot of insufficient cages for the animals, especially for the birds, that there were birds crammed into rusted wire cages, too many birds in one cage," Sonja Meadows, the founder and lead investigator of Animals' Angels, told The Dodo. "Then they complained about dogs being sick, dogs being without water in the hot summer heat. And horses being sold with bad feet." When investigators arrived, it was worse than they feared. The flea market, which is held once a month on the Curry Trade Grounds, is home to the infamous Dog Alley, where hundreds of vendors set up shop to peddle puppies and other animals. Animals' Angels estimated there were around 500 animal vendors each market, with around 350 selling dogs. "A lot of them were private individuals; there were backyard breeders bringing animals to the sale," Meadows said. "Definitely several of the sellers we suspected to be puppy mills." Some breeders had dozens of puppies with them, who were being sold, in some cases, for as little as $30 each with no information about their backgrounds. 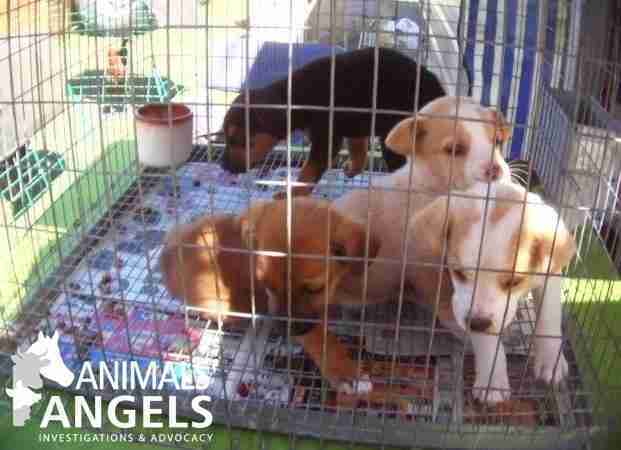 The dogs were left in shoddy cages or pens with no water or shade. "There was one dog that was kept in a homemade, very rusted cage that had no flooring and the wire holes were too big for its paws so it couldn't move at all," Meadows explained. "All it could do was lie on its side because the moment it would move its feet would fall. And the cage was lifted off the ground." She explained that the only entrance to the cage was a roughly cut hole in the wire roof, and anytime someone wanted to see the dog he would be pulled out through the hole, passing by the exposed rusty wires. "It was really quite scary," she said. Many of the dogs also appeared to be sick, particularly with parvovirus, a highly contagious and and potentially fatal disease often spread through overcrowding and poor sanitary conditions in kennels and similar environments. Parvo can live in soil for months, and because of the poor conditions in Dog Alley, Meadows said, even the dirt was riddled with the virus. The fair organizers could not be reached for comment. "We were told by several sellers that these fairgrounds are infested with this disease," Meadows said. "And that's why some of them were passing out hand sanitizer and asked you not to let the dogs lick your hands because it's so infested." "We saw several dogs that were sneezing and coughing and had watery eyes; you don't know what you buy if you buy a dog there, because there is no information you can rely on," she added. "We spoke to several visitors as well and they said they purchased dogs from the fairground and they had that issue - their dogs were infested with parvo." Meadows said the problem stemmed not just from the shoddiness of the site and poor care of the dogs, but also from the fact that the flea market had minimal standards about which animals they'd allow to be sold on site. "You can just show up with your animals, and there is no vet that looks at the animals once you arrive there," she said. "You could be selling a sick animal and nobody would ever know." As evidence of just how commoditized the dogs were, Meadows said, many vendors decide it's not worth it to cart their unsold dogs back home after the event. "We found out that a lot of the dogs - if they don't sell - they're abandoned after the sale," she said, noting that animals were often found wandering around the site after the flea market was over. "Because we requested police reports from after the sale." The conditions were similarly brutal for the other animals at the fairgrounds, where livestock as well as pets are sold. 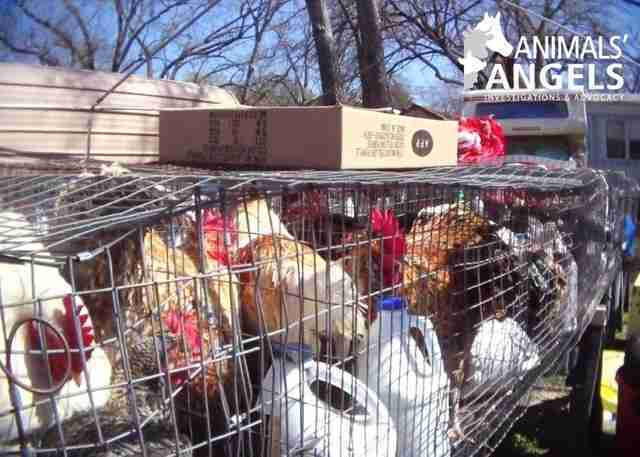 It was particularly bad for the chickens and other birds, who were packed tightly into cages with no room to turn around. "In one cage it was so horrible," she added. "One of the chickens was in a corner and had no way to get away and the other chicken was cannibalizing it. It was plucking bloody pieces from its back, but there was nowhere for the other chicken to go." Like the dogs, the birds and other animals were left for hours in the midday heat without any shade. "They would place them in full sun with no access to water," she said. "The chickens as well as the rabbits and some of the dogs had no water - the dogs [were] panting heavily." Many of the birds, including ducks and turkeys, were also abused by the people around them. "We saw birds being kicked around in cages on the ground, and being pulled out by their wings," Meadows said. "Once they were sold they were stuffed into feed bags and carried away." She added that the rabbits, horses and other livestock animals at the flea market faced similarly harsh treatment. Unfortunately, this situation is not uncommon. 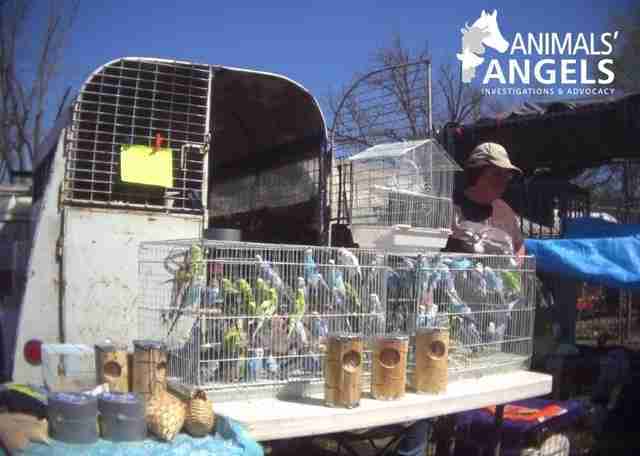 Flea markets are often a golden opportunity for puppy mills and other irresponsible animal sellers - customers often make spur-of-the-moment decisions, and fairgrounds have little barrier to entry for even the most questionable animal dealer. Last year, the Humane Society of the United States (HSUS) conducted a similar investigation into 21 flea markets, and found that many of the vendors who portrayed themselves as small hobby breeders were really linked to large puppy mills. 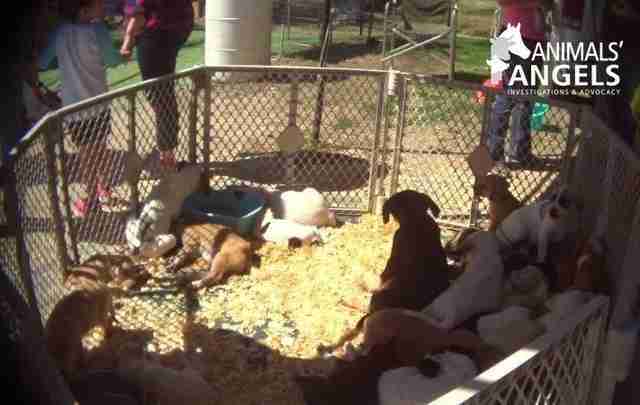 "Thanks to a loophole in the Animal Welfare Act exempting face-to-face sales, most of the breeders who peddle puppies at flea markets are not subject to even the most minimal regulations and inspections by the USDA," HSUS wrote. Some vendors at the Canton Flea Market also told HSUS that nearby ranchers would shoot the dogs who were abandoned after the sales, presumably because they were a nuisance. Meadows said she hopes that the public will realize that the markets' lax rules lead to the inhumane treatment of animals. "The answers that we received [from the investigation] were quite concerning," she said, noting that she encouraged flea market patrons to contact law enforcement if they see anything that concerns them. "Live animals should not sell at unregulated flea markets." 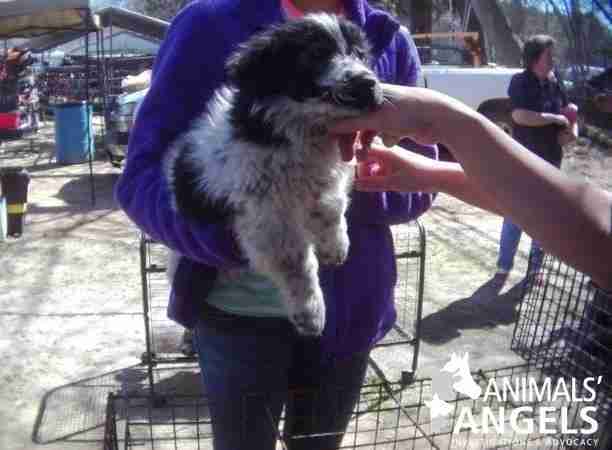 Would you like to help the dogs, birds and other animals being sold at these fairgrounds? First, you can avoid giving business to irresponsible sellers. If you see something suspicious, contact officials. 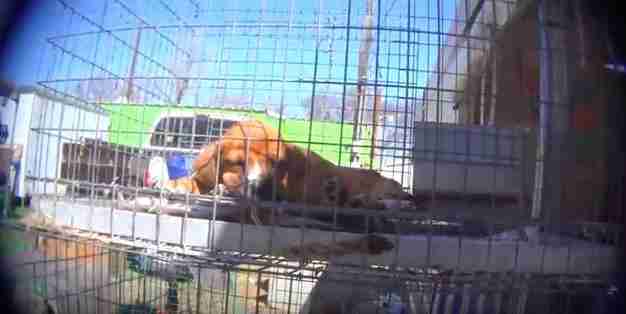 You can also click here to sign a petition asking the National Flea Market Association to stop selling dogs, or contact the organization directly to ask them to forbid the sale of all animals. You can also make a donation to Animals' Angels to support its ongoing investigations.